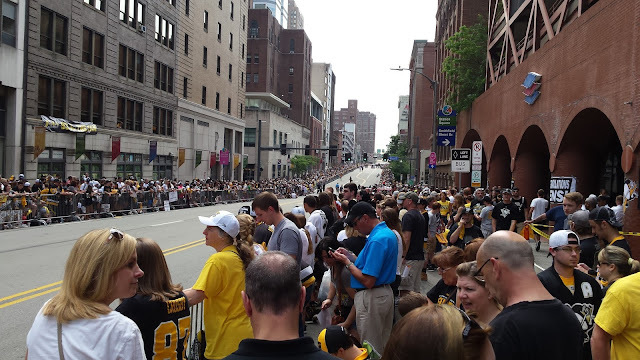 Pittsburgh sure knows how to throw a party, doesn’t she? This was my first championship parade and it was so organized, you'd think these parades happen every weekend. 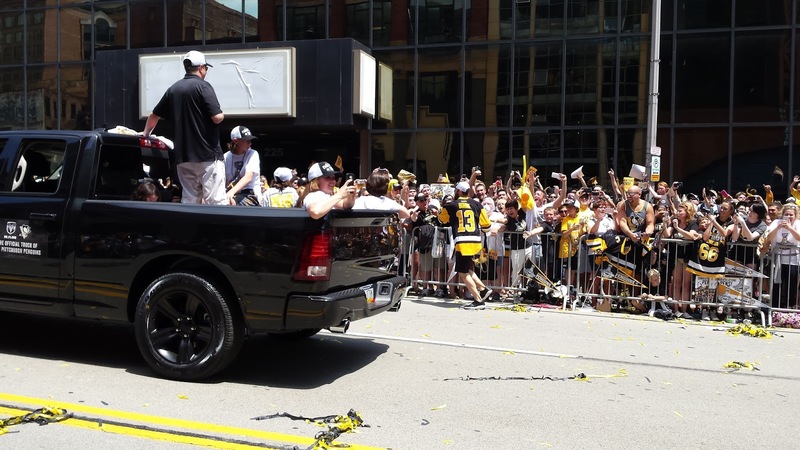 More than 400,000 people attended Wednesday’s Stanley Cup parade to celebrate the Penguins’ fourth Cup. The parade didn’t start until 11:30 but some folks started claiming spots the night the before. My plan was to get down there around 7, but I underestimated how much I hate mornings and how long the line was at my favorite Dunkin Donuts. It takes me about an hour to get to Pittsburgh from Youngstown and I didn’t get on the road until close to 8. (I really, really hate mornings.) I was a little nervous about getting into the city so late. I prepared myself to sit in traffic for awhile, but there was only a little bit of congestion on I-79. I had no problem finding cheap parking near the Alleghany station and all the only T passengers were eager, happy Pens fans. Stepping out of the Gateway station into the city felt like walking into Candyland. That's the only way I can think to describe it. The sun was shining, and the excitement and anticipation was palpable. I followed the flock down Stanwix toward the right side of the stage where I knew Medina was. But by 9, there was no getting through. Everyone had the same idea - get as close to the stage as possible. I tried to cut down Market to approach the corner of Stanwix and Allies from that direction, but people were packed in even tighter on that corner. That area was feisty. Those that were already there were frustrated with the people who were trying to fight their way past them. Lines of people trying to get to the corner just had to turn around and fight their way back through. I gave up and headed the other direction on Allies looking for an open spot. The crowd was noticeably thinner on the other side, probably because there was no easy way to cut across. I followed a couple of other rebels through a hole in the fence and crossed the parade route. Finding a spot along the fence rail proved harder than I thought. The people that were already there were spread out with enough space between them to fit a person or two. I was riding solo. I'm just one person who wanted to get up front. Surely they'll let me in. No. Everyone was saving spots apparently. I do not condone spot saving. Especially not for an event this big. I don't have a lot of respect for a "saved" spot. I was there. Your buddies were not. You're telling me I have to honor your ridiculousness for someone who's going to show up two hours after I got there? Give me a break. I was standing behind this one guy who was sitting on the ground playing on a tablet with his belongings spread out. He was leaning against the fence and kept glancing up at me from behind his sunglasses like I was intruding on his personal, private space. At a parade. He stood up and the girl next to him whispered something to him while glancing over her shoulder at me. He opened up his body in an attempt to make himself bigger. Sigh. I'll just ask what the deal is. "Excuse me, are you saving this space for someone?" He answered curtly without looking at me. "Yes-I-am-thank-you!" Whatever dude. I am not going to spend the next three hours standing behind you. I found another spot behind some chair sitters. My plan of attack was when they stood up for the parade, I'd squeeze in next to them in front of their chairs. I stood there for two and a half hours casually boxing out anyone who may have had the same intentions. It worked out. The people to their left were reluctant to let me in, but they graciously gave me a bit of railing when I assured them I was just one person and I would write nice things about them. Thank you to guy-with-glasses-who-was-digging-Porter's-'stache and girl-with-red-hair in the Crosby jerseys. With the humidity and sun beating down, the temp felt like it was in the 90s. Under those circumstances, I would've never expected that people would be as amiable as they were. Everyone was polite, not really too rowdy until the parade started, and hitting beach balls in the air in the greatest game of "don't let it touch the ground!" I can proudly say I did not let it touch the ground. Don't underestimate how entertaining a $2 beach ball is to a large crowd. Once the parade started and we caught our first glimpse of the honor guard, the crowd turned on like a switch was flipped. All around me I heard people saying, "It's time, it's time!" The crowd was so loud and we cheered so passionately for everything that proceeded past, whether it be players or horses. We screamed for the players like they were our best friends. We were so giddy waiting to see which players or personnel were next. Kunitz and Bonino ran down the line slapping our hands. When I saw that Bones was wearing a GoPro, all I could think was, "Now Nick Bonino is going to have footage of my face for forever. One of my favorite moments of the day was when Fleury and Duper's truck was approaching. 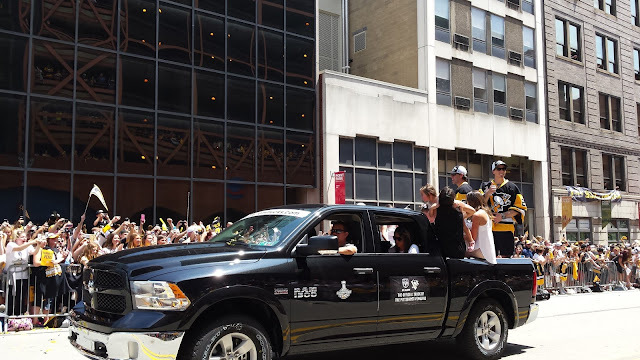 You knew who was in the truck before you could see them, because a wave of "Fleury! Fleury! Fleury!" chants moved with the truck down the road. That may have been Fleury's last day in a Penguins jersey. If he didn't know it before, he should know now just how much this city loves him. Once the parade was over, the crowd started pushing its way toward the stage. It was chaotic, but it felt like organized chaos. No one was pushy. Everyone was still in good spirits. I could tell there was some day drinkers, but no one was acting like a fool. Everyone was polite and allowing others to get by as we shuffled along. When I was leaving, I got trapped in front of the stages between the fences for a little bit. Packed in as tight as we were, people were still friendly. And it seemed like everyone remembered to put deodorant on that day. I wasn't able to get too close to the stage. I had to stand on my toes to see the screen. Someone in the area fainted but was attended to quickly. As I looked around at the people sitting on roofs, hanging out of parking decks and office windows, I noticed everyone was attentive during the speeches. No one was really having side conversations. There were thousands of people crammed into several city blocks, drenched in sweat, quickly getting dehydrated just so that we could be there for that historic day of celebration. There's a lot of bad stuff happening in the world. As hokey as it sounds, it was comforting to be with my fellow fans on Wednesday. There was so much good that day. I'm sure somewhere in the crowd there were fights or drunken shenanigans, but most of the reports say that everyone was well-behaved. 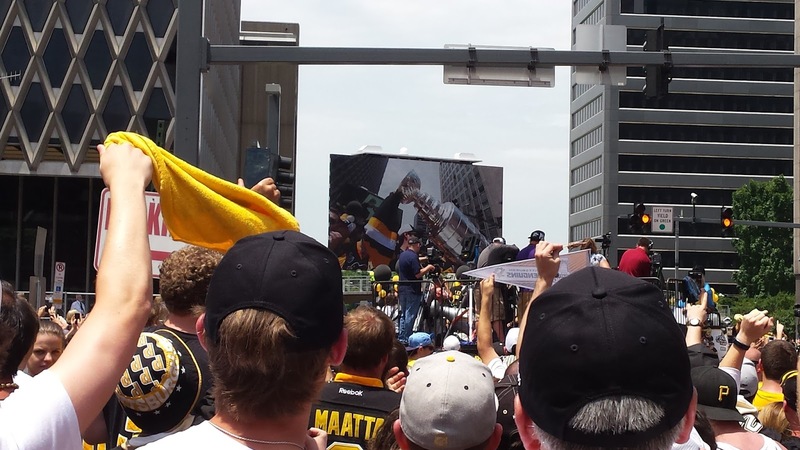 We were all there for one reason - to celebrate our Pens and the city of Pittsburgh. 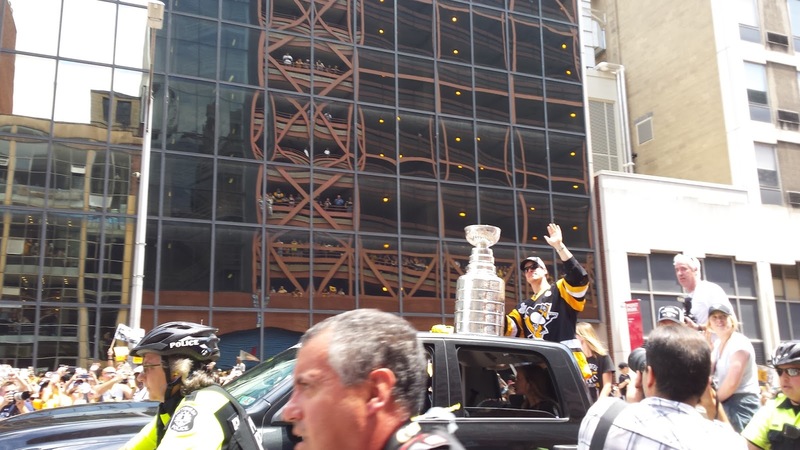 My hat's off to the city and Mayor Peduto and anyone who had even a small hand in planning the day. The symbiotic relationship between the players and the fans and the organizations makes this one of the most special sports towns. It's unlike anything I've ever seen. This small market town has a wide reach and a big heart. I'm so proud to be from this region and a part of this fan base. Let's do this again soon!